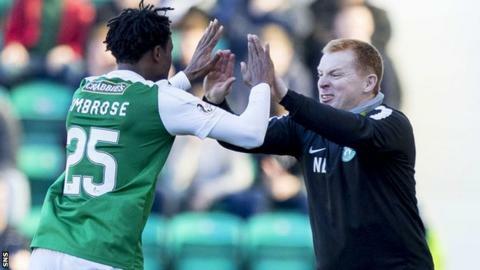 Efe Ambrose believes "no-nonsense" Neil Lennon's winning mentality is showing in his Hibernian players. The Hibs boss is close to signing a new contract, with his current deal expiring at the end of the season. And Nigeria defender Ambrose says Lennon's abrasive approach and will to win has benefited the squad. "He tries to bring the best out of me and he doesn't take nonsense. He always comes to your face to tell you what he thinks and feels," Ambrose said. "Even in training, you are always aware Neil Lennon is there looking at you. That always motivates you to be responsible, be ready at every given time, and work hard. "His most important thing is, you have to be fit. If you are not fit, he owns you. You have to be fit for him to play you. "Once he sees you training and you are not up to it, if he sees you are slack or your shape is not good, he is on you and you know you are in for it. "Sometimes it's difficult to keep him smiling - the best way is to do the right thing on the pitch, give him the result and work hard." Lennon signed Ambrose, 28, while manager of Celtic in 2012, where the centre-back made more than 100 appearances. The pair were reunited at Easter Road in February, with Ambrose joining Hibs on an emergency loan deal, before agreeing a permanent move this summer. "I'm happy for him to stay because working under him has really helped me, the lads and the club," Ambrose said of Lennon's impending new contract. "For him to get a new deal is going to be great for the club, the players and the supporters. I think he is one of the best managers in the country. "It's the winning mentality he is trying to put into the squad. When you have that mentality, no matter what game, you play it like a cup final. "Every game he played, he coached, it doesn't matter, he approached every game as a cup final for him. "I believe with time we are going to grow into that mentality - it is not easy, we have to work hard on the pitch." After securing Hibs' return to Scotland's top flight in his debut campaign, Lennon oversaw Premiership victories over Partick Thistle, then Rangers, and guided his team to the League Cup quarter-finals. Saturday's insipid home defeat by Hamilton Academical was the side's first of the season and Ambrose believes learning lessons from the disappointment is vital. Hibs travel to Dens Park on Sunday to face a Dundee outfit who have lost their three opening league matches. "The most important thing is how we bounce back," Ambrose said. "I believe we have the willpower, coaching staff and everybody to help us to do that. "I believe the next game we are going to see a different Hibs mentality and approach to the game. "We've learned from it. We do not want to go back and see Lennon the way he was after the game. "We know we need to go back, work, train harder and put everything in perfect condition for the next game. "It's not been easy for the past few days after we lost that game, we have been working and training harder, because we know we need to step up."